1.8 MYA adult cranium of Olduvai Gorge, Tanzania by Mary Leakey. 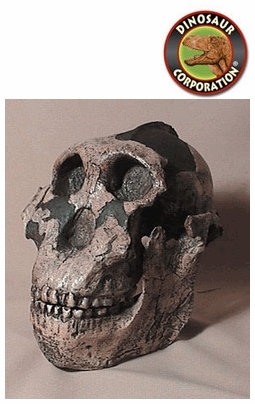 Paranthropus boisei (originally called Zinjanthropus boisei and then Australopithecus boisei until recently) was an early hominid and described as the largest of the Paranthropus species. It lived from about 2.6 until about 1.2 million years ago during the Pliocene and Pleistocene epochs in Eastern Africa. The brain volume is quite small, about 500 and 550 cm, not much larger in comparison to Australopithecus afarensis and Australopithecus africanus. It had a skull highly specialized for heavy chewing and several traits seen in modern day gorillas. P. boisei inhabited savannah woodland territories. Males weighed 68 kg (150 lb) and stood 4 feet 3 inches (1.3 m) tall, while females weighed 45 kg (100 lb) and stood 3 feet 5 inches (1.05 m) tall. The average adult males were much larger than females (sexual dimorphism), as was the case in virtually all australopithecine species. The back molar teeth were relatively large, with an area over twice as great as is found in modern humans.